The definitive issue-by-issue collecting guide and trade reading order for Gotham City comic books in omnibus, hardcover, and trade paperback collections. Part of Crushing Krisis’s Crushing Comics and The Definitive Guide to Collecting Batman Comics. Last updated February 2017 with titles scheduled for release through July 2017. 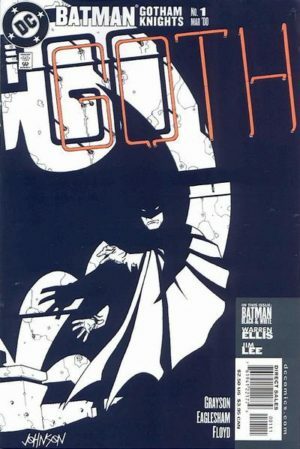 To start, this guide focuses on literal “Gotham” comics – books with the word “Gothman” in their titles. As the DC Guide expands, it will act as an index for other Gothman-based titles covered on other pages. A pair of John Ostrander mini-series. 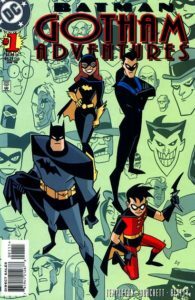 A non-continuity series told with the characters of the Batman Animated series. #29-33: Not collected. Written by Chuck Dixon, Scott Petersen, Ty Templeton, Scott Petersen, & Ed Brubaker, respectively. #34-49: Not collected. Written by Scott Petersen. #52-57: Not collected. Written by Scott Petersen. 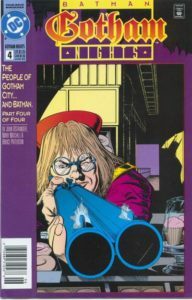 Cameron Chase was introduced in Batman #550; some of her series takes place in Gotham. Collects Batgirl Secret Files and Origins (2002) #1, Batman (1940) #550, Chase (1998) #1-9 & 1,000,000, DCU Villains Secret Files (1999) #1, The Flash Secret Files (1997) #3, Hawkman Secret Files and Origins (2002) #1, Joker: Last Laugh Secret Files (2001) #1, JSA Secret Files (1999) #2, Secret Files & Origins Guide to the DC Universe 2000 (2000) #1, Superman: Our Worlds at War Secret Files (2001) #1. Issues #1 & 6-8 were collected in a prestige-style one-shot, DC Comics Presents: Chase (2010) #1, #7-8 in Tales of the Batman: J.H. Williams III hardcover, and #1,000,000 in DC One Million Omnibus. This pair of Elseworlds issues by Doug Moench were already in a prestige format, but they were then consolidated into a single issue in 2011. An Elseworlds tale co-written by Mike Mignola. An Elseworlds tale from classic 80s Bat-team Doug Moench and Kelley Jones. Also includes stories created uniquely for the hardcover. Note that Volume 1 collected Batman Black and White (1996) #1-4 (1996 hardcover / 2000 paperback / 2007 paperback / 2015 book+DVD). Azrael: Agent of the Bat (1998) #91-92, Batgirl (2000) #29 & 33, Batman (1940) #603-607, Batman: Gotham Knights (2000) #30-32, Birds of Prey (1999) #43, Detective Comics (1937) #771-775. Issue #30 is also in Batman: Harley Quinn (2015) – TPB and DC Comics Presents: Harley Quinn (2014) – #1, both above. 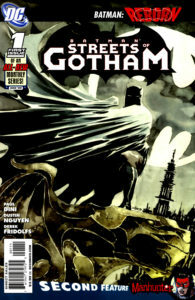 Issue #32 is also in Batman: The Greatest Stories Ever Told (2005) – TPB vol. 01. #61-65: Not collected, “Human Nature” – a Poison Ivy story. By Ed Brubaker and Sean Phillips. Recollected in DC Comics Presents: Batman – Gotham Noir (2011) #1 along with Batman (1940) #604. A series focused on the Gotham City Police Department written by superstar writers (and noir specialists) Ed Brubaker and Greg Rucka with artists Stefano Gaudiano, Michael Lark, and Kano. Written by Steve Niles. Originally released as prestige format issues. A Halloween story written by Steve Niles with classic Bat-artist Kelley Jones. 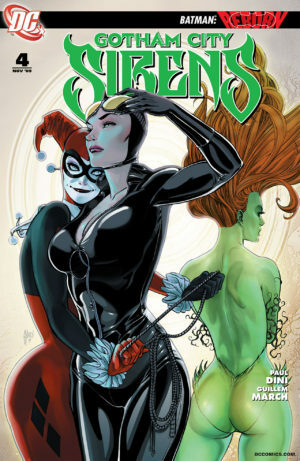 Launched by Batman Animated Series mastermind Paul Dini, this book focused on Catwoman, Harley Quinn, and Poison Ivy. This series ended at the beginning of Flashpoint, just prior to New 52. A one-shot recollecting Batman: Gotham Noir (2001) OGN SC, above, along Batman (1940) #604. A limited series that began just shy of New 52. One-shot collecting Catwoman: Guardian of Gotham (1999) #1-2, above. Digital series collected in print in Batman: Li’l Gotham (2013) and the first two issues in Halloween Comic Fest 2013 – Batman: Li’L Gotham Special Edition (2013). 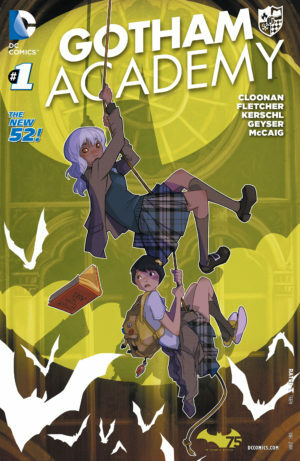 Despite being a funny, all-ages series, Gotham Academy is in continuity with present day Batman stories! See also New 52. 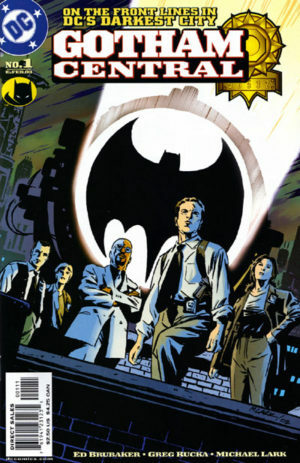 Written by Ray Fawkes, this series stars Spectre along with Batman’s Gotham-based supporting cast. See also New 52. Check Amazon for DC’s newest Gotham titles.